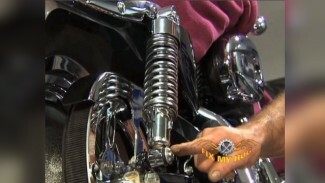 Heated motorcycle grips are a really popular upgrade that most riders would prefer to have on their motorcycle. There are several on the market to choose from. These heaters are also available for, both, a conventional throttle or for throttle by wire. The instructions for heated motorcycle grips are fairly straightforward. Wires are routed through the handlebars. There is a heat element on both ends with a thermostat switch on the new, left side, clutch perch clamp. The unit can be easily powered from an open accessory power source or you can get creative and power up from another reliable source on the motorcycle. Start by marking the end of the clutch perch original location on the handlebars with a sharpie. Then, you can begin by removing the left side clutch perch, switch housing and left side grip. This kit comes with a replacement clutch perch clamp which holds the control switch. Mock this clamp against the left side bar aligned with the mark that was previously made on the handlebars. Now, make a mark on the bars where the wires exit the clamp. You will now need to center punch this spot and drop a 5/16″ hole. Be sure to clean up any sharp edges left in the hole and carefully install the, supplied rubber grommet. Move on to the right side. Shim the front brake lever to avoid breaking the front brake switch. Then, remove the front master cylinder, right side switch and right grip. 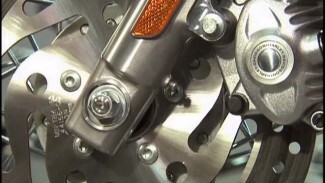 If your ride has a twist grip sensor, you will need to either remove its harness completely from the handlebar, or partially pull it out from the end of the handlebar as Mike explains. If you have conventional throttle cables, you need not worry. Snake the wires from the right side heater, through the bars, and out the left side. Snake your power wires from the center hole in the bars to the left side also. Now you are ready to install the right side heater. If you have a twist grip sensor, clean the sensor body and adhere the heat element to the sensor. Check for burrs in the handlebar opening. File any sharp, raised edges. Carefully slide the twist grip sensor and element into the handlebar end.